The first two games on this trip featured the two teams in last year’s World Series – the Cubs and the Indians. The Indians were actually the visiting team at the Texas Rangers’ Surprise Stadium in Surprise, Arizona, founded in 1938 by Flora Mae Statler, who named it Surprise as she “would be surprised if the town ever amounted to much”. 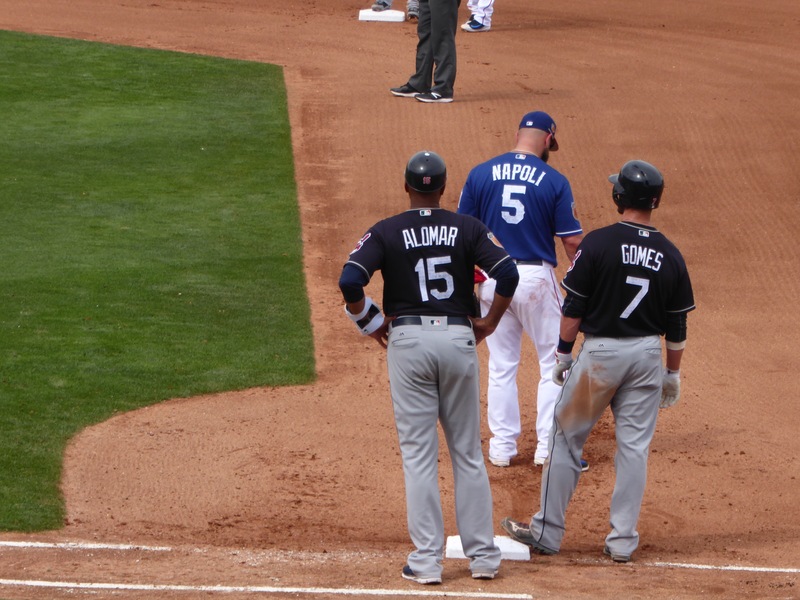 Before the game started, I witnessed a poignant moment at home plate when the Indians manager, Terry Francona, gave a big bear hug to Mike Napoli, who played first on the Indians 2016 World Series team before being traded to the Rangers in the off season. Most of the veterans in the big leagues know one another and many friendships cross team lines. 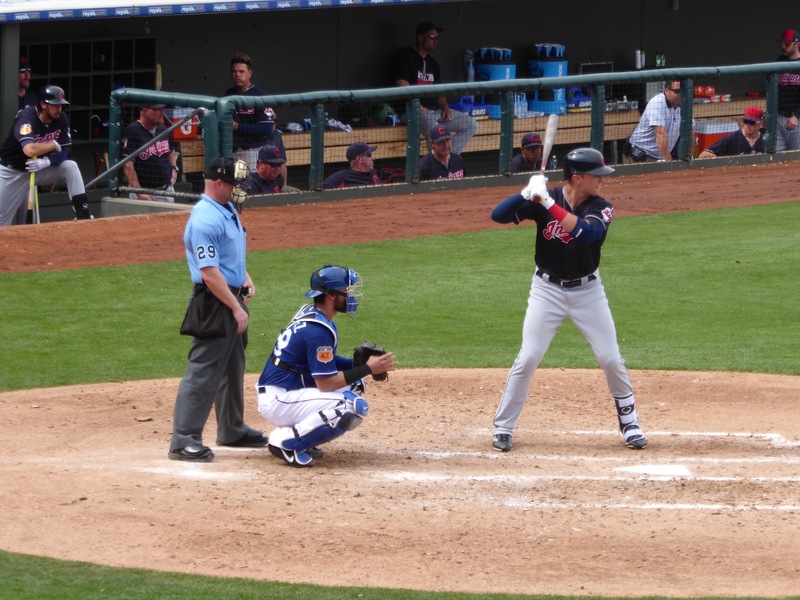 Not many stars played for either team, though the Indians starter, Trevor Bauer, he of the unconventional training techniques, did reasonably well, getting the Indians out to a 7-1 lead after three innings. That said, this was not a particularly well-played game. For example, early on, the Rangers had runners on first and second with no outs. The batter hit a long drive to deep center and the runner on second naturally tagged up to go to third. The center fielder, making a rookie mistake, threw to third (he had no chance of getting the runner), which enabled the runner on first to tag up and advance as well. So instead of having runners on first and third with one out (which would have been the result had he properly thrown to second), thus keeping the double play a possibility, they had runners on second and third. There were other errors as well and a whole lot of offense. That’s not surprising in spring training, since pitchers are honing their skills for the regular season and taking care to avoid injury, whereas the hitters are freer to swing away. So this game saw 31 hits by the two teams and a final run by the Rangers in the bottom of the ninth brought them from behind to win 12-11. One tidbit you don’t see much in the regular season is the bat boy taking water to the field umpires a couple of times during the game. Makes sense, given that these games are played in the afternoon in 90 degree weather. Remember too that most regular season games are played at night. A word about food. Finally, a decent bratwurst! Finally, a word about base coaches. The Indians first base coach, Sandy Alomar, had a very distinguished playing career and a very short managerial career, but rumor has it that he’s been on the short list for a managerial post several times. 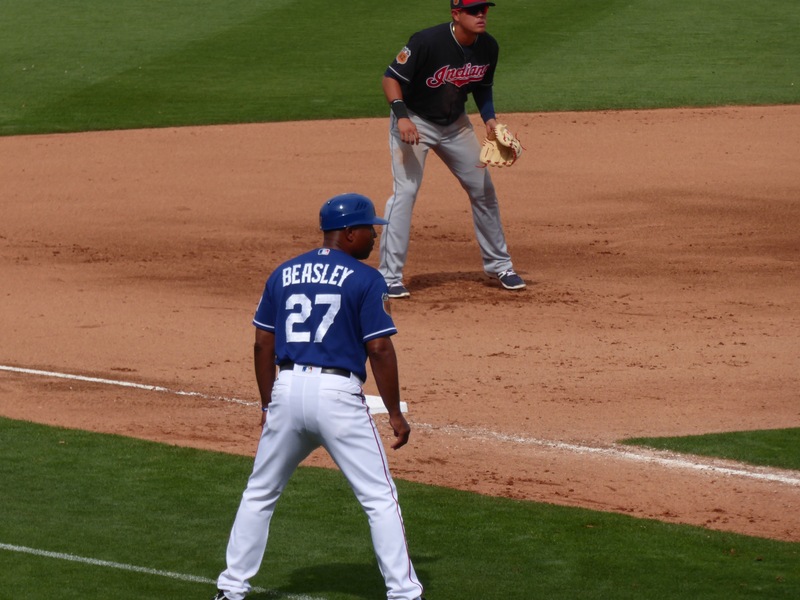 Tony Beasley, the Rangers third base coach, never played in the majors, but has a long coaching and managing career in the minors and several years of coaching in the bigs. Typically, third base coaches become managers and first base coaches don’t. These two may not fit the mold. Excellent historical bits and insights gone unnoticed by the average fan. Thanks again for keeping it going!